Isolation and frustration are common themes in communities still traumatised and suffering one month after the devastating floods which hit Cumbria. Dramatic rescue pictures were beamed across the world and officials say 2,064 homes and businesses were flooded as the county experienced unprecedented rainfall on 20 November. Six bridges collapsed and many more were closed over safety fears in the wake of the torrents. This has effectively cut off towns, villages and housing estates on the north side of the River Derwent from the A66 - the main route into the major centres of Workington and Cockermouth. Peak-time journeys that took only a matter of minutes before the floods are now running into hours with drivers hitting "bumper to bumper" traffic on parts of the long detour route. The village of Papcastle, near Cockermouth, which is next to the only remaining road bridge over the river, has now found itself at the centre of the detour bottleneck. Millions of pounds has been pledged to repair the destruction but despairing residents just want to hear news that the bridges are to be reopened or rebuilt. Ladia Whitfield, 52, whose bungalow on the south side of Cockermouth was wrecked by the flood waters, is now living in bed and breakfast accommodation on the town's only north side estate. She said the closure of the town's Gote Bridge and collapse of the Memorial Gardens footbridge had left residents on the north side with a five-mile commute to get to the main shops just 300 ft (90 metres) over the river. And with the estate boasting very little in the way of shops or cafes, the local church, which is also putting on daily bus services, now provides the main source of community spirit with a special canteen. "It is now a month later and people feel as isolated as they did on day two after the floods", she said. "Emotions are very raw and it is all people can do not to cry when they talk about getting the bridges open. "They are desperate to get into town and just buy the normal things. "Everyone is trying to rally round for Christmas but there is a sad cloud hanging over this side of the town." The feeling of frustration is being mirrored in Great and Little Broughton, villages suffering from the closure of the flood damaged Broughton Bridge. One of the crossing's arches has a hole below the waterline and will have to be repaired with a new concrete support. Eric Nicholson, district councillor for Broughton and St Bridget's ward, said this work was unlikely to be finished until the end of January as contractors were demanding too much money to work over the Christmas period. He said: "At peak times the traffic is horrendous and it is taking 40 minutes to travel one mile - it used to take just seven minutes to get from Great Broughton to Cockermouth. "Everybody is just praying for the bridges to be reopened but some contractors are asking for almost double to work over Christmas. "This is frustrating at a time when we want everybody to buckle down and put holidays on hold to another time." 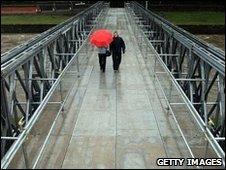 The most dramatic images of bridge closures came out of Workington. The town was effectively split in two as the waters destroyed the Northside road bridge, a nearby footbridge, and left Calva Bridge on the brink of collapse. Drivers have been left with an 18-mile detour, via the Papcastle bridge, to reach the other side of town. An Army-built footbridge, named Barker Crossing, after Pc Bill Barker who was swept to his death from the Northside Bridge, has since helped unite the two sides of the town, as has the building of a temporary railway station on the north side. Last week it was announced that a temporary road bridge should open by late spring 2010. The county council will have to go through the long process of design, tendering, letting contracts and construction before permanent replacements span the river at Workington. 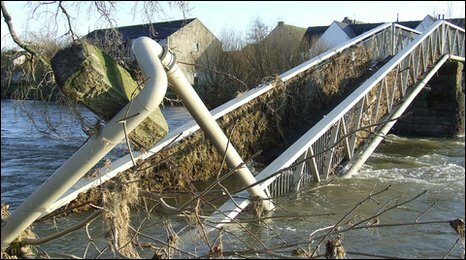 John Robinson, of Cumbria County Council's highways department, said 1,400 bridges had been checked for structural damage and fourteen remained closed. He said: "We have been struggling because of the bridge closures but we are doing what we can. "We will know more about the Gote Bridge in Cockermouth on Tuesday when divers will hopefully be able to inspect it beneath the waterline. "If we can get that open it will be fantastic and that will solve a large part of the problems. "It won't be a quick fix but we are looking to repair the Memorial Garden footbridge."